The western German city of Dortmund on Saturday saw a far-right march outnumbered by scores of anti-fascists. To prevent violent clashes between the groups, thousands of police officers were deployed from all over the country. Over 100 far-right activists took to the streets of the industrial city of Dortmund to mark the tenth anniversary since a far-right extremist stabbed and killed a teenager in one of the city's underground stations. Clashes occurred on Saturday, as a rival demonstration took place nearby, police said, according to DPA news agency. 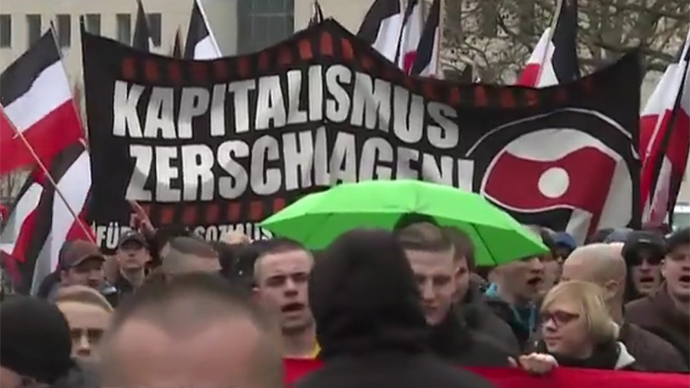 'Immigration means social growth' and 'Capitalism beaten' read the banners of a 2,000-strong crowd of far-left activists, who eclipsed the far-right march heavily guarded by police. A group of left-wing activists tried to break through a police barricade to get to the members of 'Hooligans Against Salafists,' who are against fundamental Islamists in Europe. They later threw bottles and firecrackers, though no one was injured. Police were waiting for demonstrators not only from Germany, but also from neighboring countries. “We are facing one of the hardest and most perilous engagement for years,” said police chief Gregor Lange.